Gaming revenues are up as America’s Favorite Playground seeks to drive casino growth by restoring its grandeur as a seaside resort destination. The Atlantic City casino industry entered 2018, following its second year of increased gaming revenues, with two new casinos preparing to open this summer, and a major private-public development that includes a new Stockton University campus on the boardwalk moving toward mid-year completion. Economic development and casino industry officials say the casino industry here is rebounding, in part because of the growth of casinos as entertainment venues and internet gaming. Atlantic City’s casinos are banking on a strategy of restoring the city’s reputation as a seashore resort and entertainment destination that will draw players from among the tourists who have come here for other leisure amenities. The openings this summer of the Hard Rock Hotel & Casino with more than 7,000 seats in two entertainment venues, and the Ocean Resort Casino in the former Revel Casino Hotel should bolster Atlantic City’s draw as a destination. The Hard Rock, which is spending $375 million on renovating the former Trump Taj Mahal, has retained “Little” Stevie Van Zandt as a consultant for attracting musical acts. The increase in casino revenues follows a decade of retrenchment that saw the demise of five of the 12 casinos closing in 2014, taking 11,000 jobs with them, as competition from surrounding states grew. The state Division of Gaming Enforcement reports all seven casinos’ revenues rose to a total of $2.66 billion in 2017, an increase of 2.2 percent over 2016. Every internet gambling operation reported increased wins as total internet revenues grew by double digits for the fourth consecutive year. The $245 million in 2017 online casino winnings were up nearly 25 percent. The Golden Nugget gained the most revenue online: $68.5 million. “The casino industry absolutely is making a rebound with the pending openings of the two new casinos. You’re looking at close to 6,000 jobs there,” Chief Operating Officer of Stockton University’s Atlantic City campus Brian Jackson says. The new Stockton campus is the centerpiece of the Gateway Project. That public-private partnership with the Atlantic CityDevelopment Corp. (AC Devco), South Jersey Industries, an energy holding company that will move its headquarters to the city, and Stockton University, also includes 15,000 square feet of retail space and a 5,000-square-foot AtlantiCare Urgent Care facility. “I think Atlantic City has an opportunity to turn around that it never had in the past with: the expansion of the casinos; South Jersey Industries moving its headquarters to the city as part of the Gateway Project; and the expansion of Stockton University and AtlantiCare, both of which are anchor institutions for the city,” Jackson says. Still, the $2.66 billion in 2017 casino revenues was just half of the industry’s peak of $5.2 billion in 2006. Three of the seven operating casinos reported 2017 revenue below 2014, the year the industry consolidated from 12 to eight casinos. Other uncertainties remain for 2018, including the future of sports betting in Atlantic City, now before the US Supreme Court. And, only time will answer the question of how the openings of Hard Rock and the new Ocean Resort Casino will impact existing casinos. Another issue is that Gov. Murphy’s campaign promise to repeal the state takeover of Atlantic City executed by former Gov. Christie remains unfulfilled and Murphy’s position is unclear. During an appearance in January, Murphy stopped short of saying he would end the takeover, saying the state needs to remain a partner in restoring better economic times. Even South Jersey legislators in his own party seem reticent about undoing the takeover. Colorado-based investor Bruce Deifik told New Jersey Business magazine in January that his purchase and repositioning of the Revel as the Ocean Resort Casino poses “a great opportunity to bring a state-of-the-art sports book to a city which caters to a large and diverse sports market.” Deifik acquired the Revel for $200 million and plans to reopen it by the summer with 138,000 square feet of gaming space, 100 table games and 2,200 slot machines as well as 165,000 square feet of meeting and convention space and a 5,700-seat concert hall. 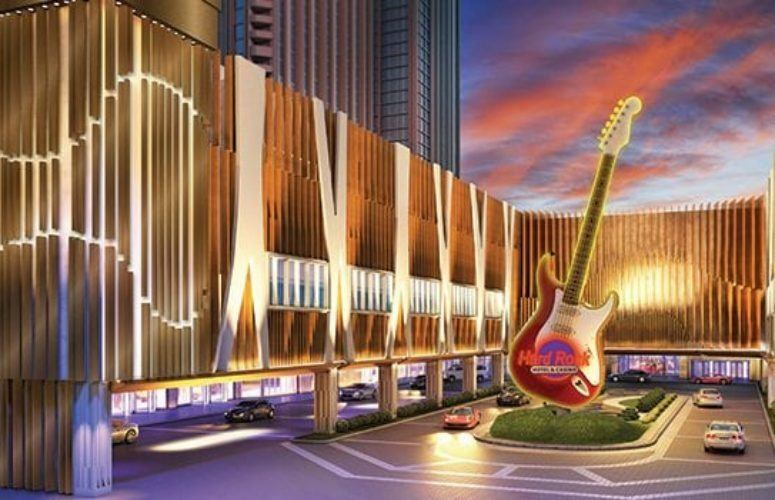 The opening of the Hard Rock Hotel & Casino on June 28 on 17 acres along the Boardwalk will add 2,100 slots, 120 gaming tables and completely renovated hotel rooms. The current Hard Rock Café will move to a new 400-seat venue centrally located on the property and with beach access. Two separate arenas will offer a total of more than 7,000 seats. The partnership between Hard Rock International and New Jersey residents Joe Jingoli and Jack Morris will create more than 1,000 construction jobs and 3,000 permanent jobs. Hard Rock Hotel & Casino Atlantic City President Matt Harkness says his faith in the comeback of the city’s casinos is backed by the industry’s ability to hang on through the decline and against increased competition from other states in the region. “What’s important to remember is that, even with decline, Atlantic City is still No. 2 in the country. People in this area identify with Atlantic City,” Harkness says, adding that Hard Rock’s half-billion-dollar investment and acquisition of the Taj Mahal from billionaire investor Carl Icahn will result in a multi-billion-dollar property. The Tropicana Atlantic City has invested $200 million over the past few years improving meeting spaces and creating new dining experiences as well as renovating hotel rooms and the casino floor. “Tropicana Atlantic City is a microcosm of what Atlantic City needs: capital investment, constantly reinventing itself, and focusing on the entire experience, not just gaming,” General Manager of Tropicana Atlantic City Steve Callender says. Last year, it acquired the adjacent Chelsea Hotel and is linking it by a bridge to the Tropicana as its fifth hotel tower. It was recently announced that the casino and other Tropicana Properties are being purchased by Eldorado Resorts for $1.8 billion. Stockton University’s Jackson expects the 675,000-square-foot, $210 million Gateway Project to generate more than 500 jobs, including 250 construction jobs, with a median salary of $70,000. In addition, 530 university students will live in new student apartment housing along the boardwalk. The university will add 150 full- and part-time positions. Paul Gordon is Senior Vice President of Sales at Rymax Marketing Services, Inc. This article originally appeared on njbmagazinee.com.